LED lighting technology is a vast departure from the technology behind the traditional incandescent bulb. They share no similarities in the manner of their operation, and their design is equally different as well. The incandescent light bulb is a self contained light source with no serviceable parts or components. The incandescent light bulb represents only a light source, with the fixture and its accompanying hardware making up the rest of the incandescent lamp assembly. The bulb is the light source, and the fixture contains the socket, wiring, switches and housing that makes up the rest of the whole in an incandescent lamp. This type of light assembly is serviceable because each of the component parts can be easily removed and interchanged with another, oftentimes by using parts from different manufacturers and supplies. This is because a state of industry wide homogeneity exists around the incandescent lamp design that allows such interchangeability. LED light assemblies on the other hand are an entirely different animal. 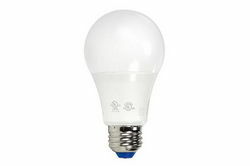 Unlike incandescent bulbs which only need to be connected to a power source, LEDs require supporting equipment for operation. An LED light source consists of the actual LEDs themselves (Diodes), a circuit assembly to control voltage applied to them known as a driver, a heat sink, optics to control and manage beam configuration, and any other peripheral circuits to allow dimming, color changing, or other related auxiliary modes of operation that may be included. Because of this complexity most manufacturers have simply performed the design and construction of their entire LED fixtures in house. This allows them to optimize each component for greatest efficiency and performance when integrated into a single fixture, but makes it extremely difficult to repair or replace components should the need arise. The result has been integrated LED fixtures that although powerful, extremely long lived, efficient, and effective, must essentially be completely replaced when they reach their end of life. This also means that as LED technology advances, these fixtures cannot be upgraded with better performing components as they become available. The exception to this is the integrated LED bulb designed to replace standard incandescent lamps. These units represent a single consumable unit that provides its performance and effectiveness by allowing use with standard light fixtures while providing improved efficiency, performance, and operational life. Integrated LED fixtures on the other hand represent an entire lighting assembly, in essence replacing not just the bulb in an overhead high bay light for instance, but the entire fixture. The reasons for this have to do with the differences in how LEDs radiate light and their power requirements, which are not compatible with fixtures designed around the properties of non solid state light sources. Thus, developers design LED fixtures designed specifically to support and take advantage solid state lightings own unique characteristics. There has been significant effort to change all of this and bring LEDs into a more standardized modality. The most significant efforts are represented by the formation of the Zhaga Consortium, an international group formed with the intention of promoting the interchangeability of LED light sources across a range of different manufacturers. This group consists of over 250 companies comprising experts and specialists from all over the lighting industry including giants like GE and Philips as well as newer entrants like CREE who specialize in LED lighting technology. This group is working together to form LED component specifications that will allow the interchangeability of modules across a broad range of manufacturers. Participation is entirely voluntary, and the group does not deal with the design or development of LED light engines, but instead is focused on creating standardized interface specifications that once adhered to, will allow these engines to be mated to any LED luminaire also adhering to these specifications regardless of manufacturer. By doing this, they hope to broaden the LED markets, reduce production costs, shorten development time, and provide enhanced performance and functionality at the consumer level by creating a standardized set of LED designs that will allow upgrade and servicing over the life of the fixture. The Zhaga Consortium envisions an eventual standardization among LED light sources that will allow interchangeability across luminaires with no modifications. This means that much like how you would simply change the bulb in an HID metal halide fixture once it burns out, you do so the same with a Zhaga compliant fixture by replacing the LED light source should it fail or reach its maximum allowable lumen drop off. This would apply to both integrated and non integrated fixture designs, providing greater flexibility for manufacturers when developing integrated and sealed designs by allowing them to switch from one supplier of LED light sources to another without the need for modifications, and provide greater flexibility for end users of non integrated designs in the form of greatly improved serviceability. The Zhaga group even envisions an eventual gravitation towards standardization that would allow end users to simply replace modules themselves, without tools or technical training, much like is done currently with standard incandescent light fixtures when replacing a bulb. When we talk about the rapid development and advancement of LED technology we tend to get caught up in the excitement generated by higher lumen to watt ratios, utilitarian improvements such as beam control, and heat management. It is easy to miss the forest for the trees and fail to realize just how much farther LED technology can and has yet to go. In this case, the future looks very much like one where LED technology although differing wildly from the standard incandescent and HID forms we have grown accustomed to, in the end winds up having more practical similarities than we expected. Standardized specifications, conformity among manufacturers, interchangeability, and user serviceability are all hallmarks of standard non solid state lighting and are a big part of the reason for its great success. By bringing LEDs into this type of standardization, acceptance and adoption of LED lighting should for all practical purposes get a great boost, something the lighting industry has been seeking for the last several years.